The World's first Hydrangea to have blue, pink & even purple tinged flowers all on one plant at the same time. A true melee of colours, without the need for any soil or fertilsier treatment many blue shades need. Unlike other varieties, LA Dreamin' will flower on both new and old wood, so is very reliable and very easy to prune and maintain. Looks magnificent in a large pot or container, it will flower all summer long into autumn, and then its lovely architectural seed heads look great through winter too. Supplied as an established plant 20-25cm tall in a 14cm pot. And now for something completely different !! 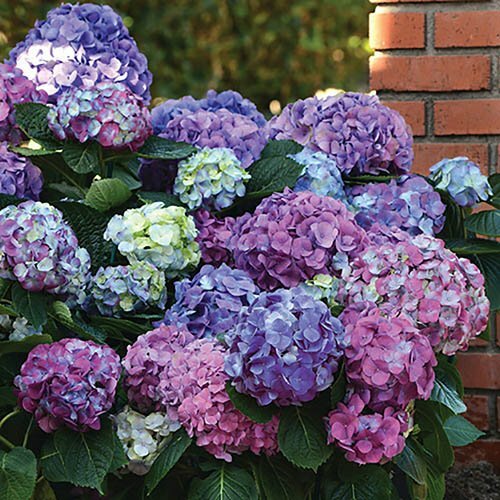 The World's first Hydrangea to have blue, pink & even purple tinged flowers all on one plant at the same time. A true melee of colours, without the need for any soil or fertilsier treatment many blue shades need. This new twist on a garden classic brings it bang up to date. The lovely softer pastel shades of blue and pink are bang on trend, and in addition, it flowers on both new and old wood, so it is very easy to prune and maintain. A real breakthrough of colour and ease of growing. Looks magnificent in a large pot or container, it will flower all Summer long into Autumn, and then it's lovely architectural seed heads look great through Winter too.